Attached is a slide stemming from a working paper entitled “Valuing our Food: Minimizing Waste and Optimizing Resources – The Scope of the Global Food Waste Problem. The Wordle software provides an interesting synopsis of the key themes at a glance. In this paper I have discussed the significance of the global food waste problem in conjunction with the 9 billion by 2050 problem — a challenge that is rapidly approaching. The world needs to provide adequate food – and nutrition – for another 2 billion people (on top of the 870 million that are hungry today) in just over 35 years while preserving the environment in the process. While planning to meet these needs, it is important to consider the massive amount of food waste that occurs annually. We know that the world currently wastes enough food to solve the hunger problem, yet for decades the challenge of the “distribution problem” has been cited as an overriding barrier in getting excess food to where it is needed to mitigate hunger. Yet our technological and innovative capabilities are continually expanding; we need a positive focus on valuing our food and maximizing resource use rather than a negative one. In this paper I have argued that it is time for a reframe — and that rather than focusing on (and getting sidetracked by) the daunting challenges of the 9 billion by 2050 problem, we need to reframe and view 9Bx2050 as a tremendous opportunity to adopt sustainability principles globally and reduce food waste, optimize resource use, eradicate hunger while preserving the environment, and bring the world closer together (eliminating hunger and improving the health of the environment will clearly create a more secure world). 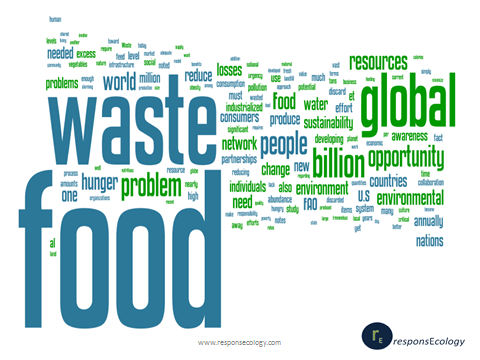 An effective, collaborative, knowledge-based global network addressing the myriad problems of food waste — and operating with urgency and transparency — is a critical aspect of 9Bx2050 solutions. This network would benefit from viewing the opportunity noted above as a series of distinct opportunities – such as raising global awareness and education on food waste, linking excess food to food deserts to make inroads on obesity and health, building community on a global level, harnessing the power of business to lead sustainability initiatives globally, and advocating an economic model with a triple-bottom line focus. Change is needed now; the current state of waste, pollution, and hunger is not sustainable.